While Inculter are an example of a group who had already blazed a path across the skies and are soaring higher with their new second album, Sacrilegia are making their first appearance, and what an explosive appearance it is: Their debut release, The Triclavian Advent, goes off like a Bouncing Betty landmine you’ve just unwittingly triggered, ejected into the air and then detonating with lethal results. 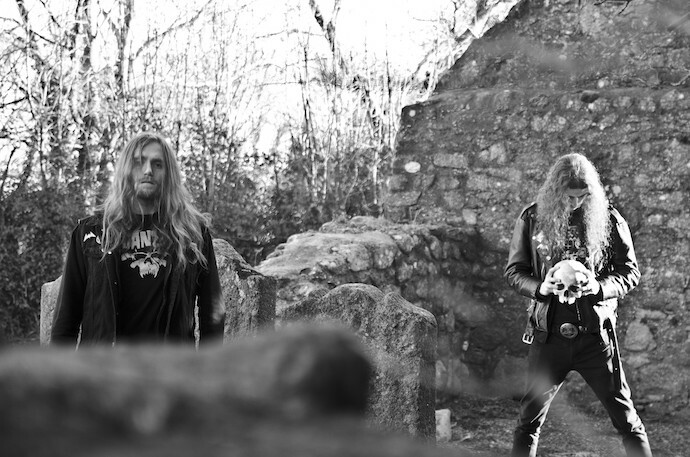 Sacrilegia’s music also proves to be a much more “blackened” take on the thrash genre. It is stupendously electrifying, mercilessly slaughtering, and sadistically cruel. Nothing about this black thrash sounds quite human. It seems like the musical imagining of rampant warfare, spraying blood in great frenzies of crazed violence, and also filling the air with the pleading screams and dismal wails of the wounded and dying. And it also offers an example of blaring heavy metal majesty. The riffs! The riffs! So many of them, and so powerful! The layering of jet-fast, dual-guitar, tremolo’d mania hits with cyclonic strength in song after song, lashing the senses with exuberant ferocity and never failing to produce big surges in adrenaline. The effect is a huge thrill, despite the fact that the intensity is so inhumanly savage. 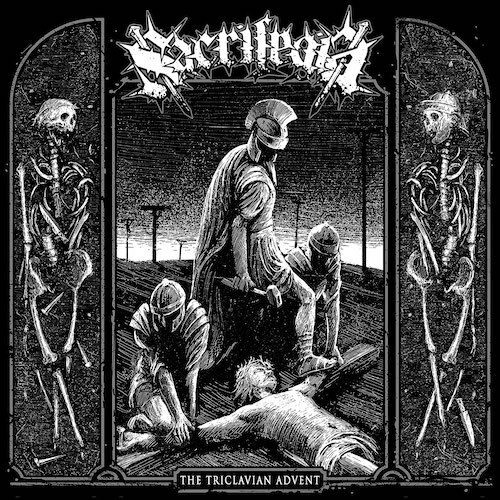 And when the riffs don’t feel like the attack of demented beasts, it’s because Sacrilegia have shifted into the sound of ice-cold cruelty, revealing a second dimension of violence. While the electrifying, explosive, and atmospheric quality of the brazen riffs is near-stupefying, the guitar work isn’t the only ingredient that makes The Triclavian Advent such a strong recommendation on this end. While the bass presence is subdued (so as not to get in the way of the riotous extravagance of everything else), the drumming is also a big draw. The rhythms are physically compulsive and constantly changing — maniacally battering, pounding like a punishing metronome, cantering, bounding in punk-like cadences, booming, and occasionally blasting like a machine-gun. 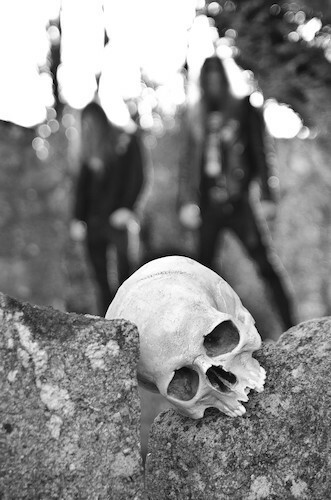 As mentioned, nothing about the music sounds quite human, and that includes the sepulchral vocals, which come out in tyrannical, reverb-drenched roars, as barbarous as the music. And while the solos to be found on the album are all quite brief, they make an eye-opening impact when they erupt (it’s hard to imagine a more stunning manifestation of lunacy than the solo in “On Herding of Swine”). For Sacrilegia, speed is the name of the game for the most part, but the band do pick their moments to decelerate. For example, in “Beyond the Fouler’s Snare” they segue into a slower-paced segment with a dismal, plague-steeped, thoroughly oppressive atmosphere, and “Unheeded Warnings” ends in surprising fashion with a spooky ambient sequence that provides the backdrop to snarled demonic proclamations. The album includes an adrenaline-charged cover of “Armoured Angel” from that band’s 1989 Wings of Death demo, and what they do with it is great, but it seems almost tame compared to Sacrilegia’s original songs, which is saying something. The album ends with a comparatively brief thrash instrumental, which makes for a bit of a puzzling conclusion (why didn’t they make this a full song? ), but it’s worth mentioning because of its name — “As With Spears We Come” — which is an apt way of summing up the advent of Sacrilegia, who present themselves with sharp-edged menace and the unbendable strength of cold steel, and whose music spears the mind with great power and intensity. Hard to believe this is the first public recording of any kind by these Irishmen. After hearing this, it will be hard to believe that they won’t go far.